Bhubaneswar: Ahead of general and assembly elections, BJP National President Amit Shah will once again visit Odisha on February 15. BJP state unit president Basant Kumar Panda on Tuesday said Shah will address party workers at Sambalpur. Around 60,000 booth-level workers of four Lok Sabha constituencies– Dhenkanal, Bargarh, Sambalpur and Sundargarh-will attend the meeting, said Panda. This will be third visit of Shah to Odisha in last three weeks. The National President of the saffron party had earlier visited the state twice, recently. 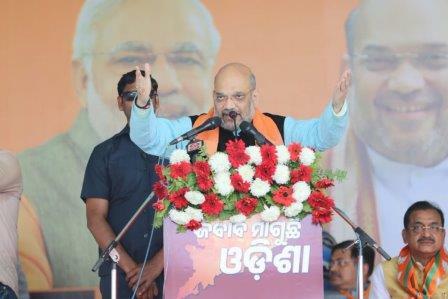 Shah had addressed a meeting of party workers at in Salepur of Cuttack district on January 29. He had addressed BJP ST Morcha’s two-day national convention in Puri on February 3.